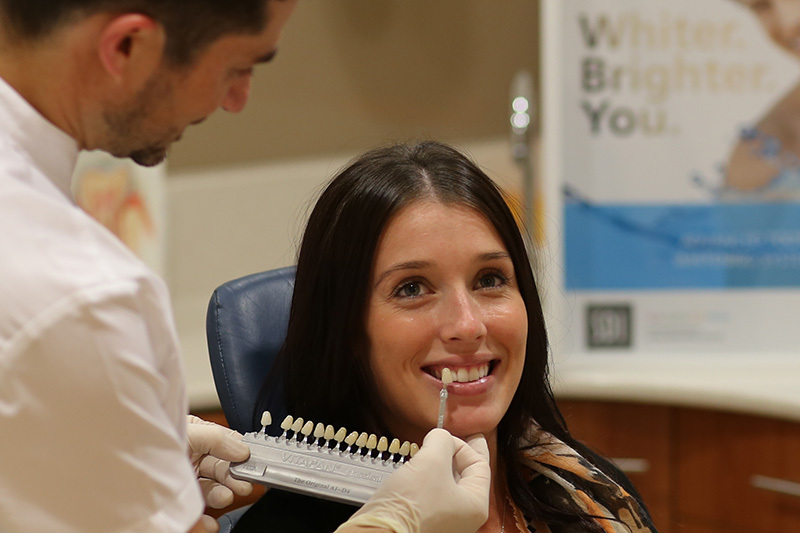 Whiter, brighter teeth in Perth in only one hour. It’s that simple! The 1 hour in-office teeth whitening system is the latest in tooth whitening technology. You can whiten your teeth in the time it takes to get a haircut, manicure or lunch! At your complimentary teeth whitening consultation, we will determine if your teeth are suitable for 1 hour teeth whitening, and what kind of result you will achieve. In most cases, 1 hour teeth whitening is used as a power bleaching session – a kick start to your whitening regime, which is often followed up by the use of our take home teeth whitening as well. 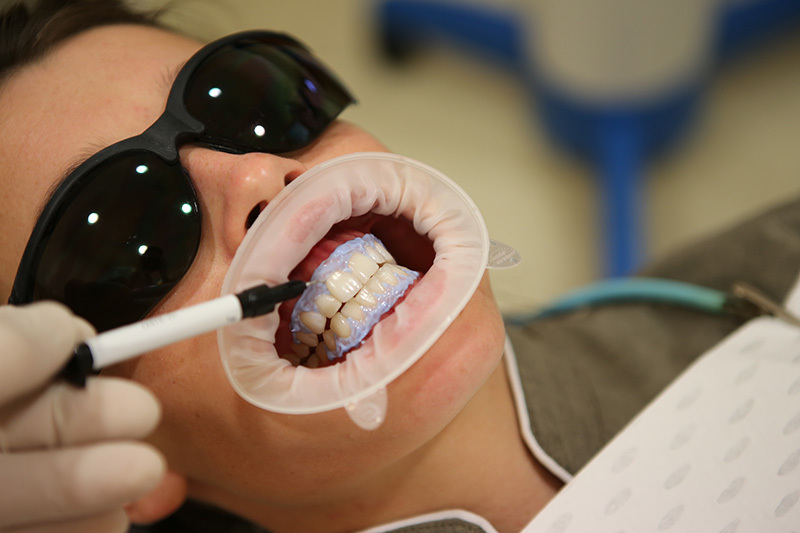 At your initial teeth whitening consultation we will assess your teeth and your expectations. A dental clean and examination is usually recommended if this has not been completed in the last 6 months. We will then advise you which whitening protocol will best suit your teeth to give you the best whitening outcome possible. We begin by taking a photo of your teeth and determine what your current tooth shade (colour) is. This is later used to compare the final whitening result. The next step is to prepare you for the application of the whitening gel to your teeth. 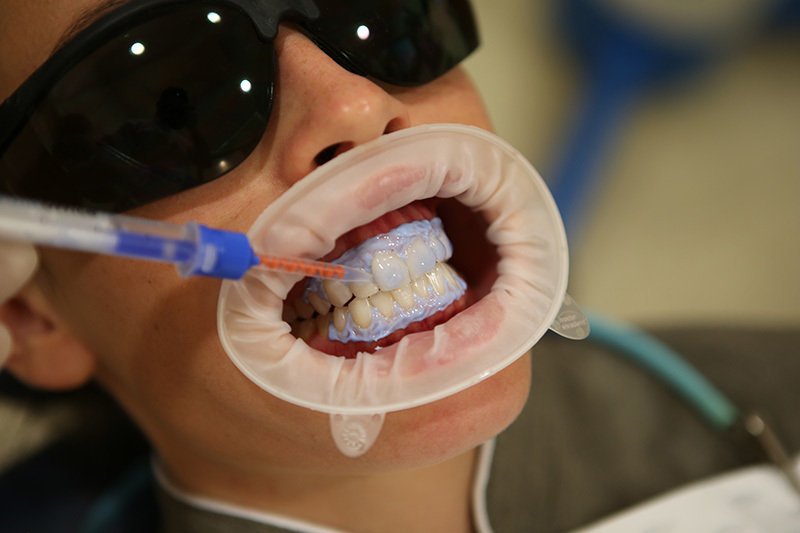 Dental Dam is placed in your mouth and around your lips. This provides us with a big wide smile so we can apply the whitening gel easily. We then polish your teeth with a pre-whitening paste to remove any plaque build up or stains that may be present. This provides a nice clean enamel surface which aids in the whitening process. 1 Hour Teeth Whitening works fast because we use a very strong teeth whitening gel. This gel can cause irritation of your gums. As a result, a resin based barrier is applied to your gums, which acts as a barrier preventing any gel irritation. The teeth whitening gel is prepared and is carefully applied to your teeth. It begins to work instantly, by entering into your teeth’s enamel and dissolving out the stains. The teeth whitening gel does not cause any damage to your teeth. For more information click here. 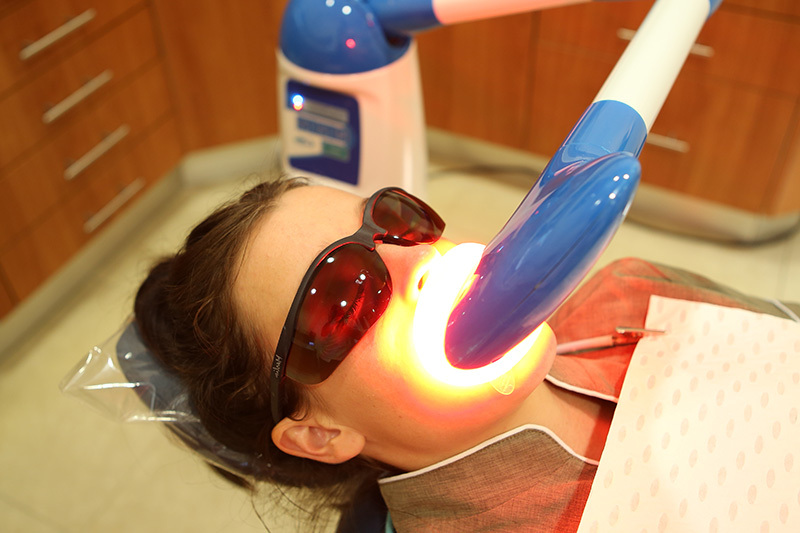 An ultra bright red led light is then placed over your teeth. This accelerates the the teeth whitening processes by providing a boost effect, resulting in the teeth whitening gel acting more vigorously and effectively. The whitening process works over several 8 minute cycles. In most cases you will require between 3 -5 teeth whitening cycles. After approximately 45mintues of teeth whitening, the whitening gel is removed followed by the gingival barrier and dental dam. Wow! Brighter Whiter Teeth, its that simple! We will then take a photo of your teeth and compare the before and after results. We will then determine if any further whitening treatment is required. The starting price for 1 hour teeth whitening is only $450. The price will vary however if your require additional whitening or other teeth whitening enhancements. Any additional costs will be explained to you at your complimentary consultation. Good news, various health funds will cover some of the cost of teeth whitening! If you would like 1 hour teeth whitening in Perth, please contact us today!